There are almost 60 Exchange Traded Funds (ETFs) listed on the local Singapore Exchange (SGX). You can find them on the SGX webpage, under “ETFs”. To make things easier, I have a screenshot of the webpage in Figure 1. From here, you can learn a few things on ETFs. The listed ETFs are typically prefixed with the name/abbreviation of the ETF providers, such as the IS Asia HYG, with IS being iShares; and SPDR being ETFs from State Street Global Advisors, etc. If there is no prefix (such as GLD ETF), a quick Google search will yield who the ETF provider is. Some ETF providers will have a number of ETFs, while a few only have one so far (e.g. UOB’s UETF SSE50 China). The good thing about ETFs is that they allow you to invest in various asset classes, as well as different regions/countries. Interested in the United States (U.S.) equities market? There is the SPDR S&P 500 US$ and the XT MSUSA US$, to name a few. Want some bonds? 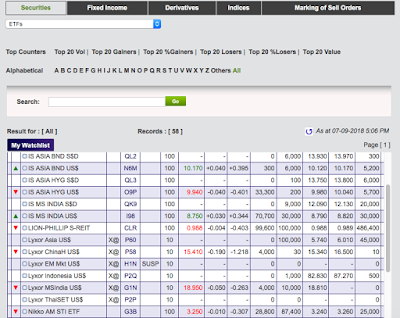 We can choose the localised ABF SG Bond ETF or the more international IS Asia BND US$, among others. REITs? PHIL AP DIV REIT, NikkoAM-STC Asia REIT or LION-PHILIP S-REIT may be your answer. If you wish to enter the ASEAN regional market, there is the CIMBASEAN 40 or the ONESTOXXASEAN. Commodities wise, we have the GLD ETF. A physical ETF will hold all, if not most, securities that made up the index that it follows, while a synthetic ETF uses swaps (a form of derivative financial instrument) with a counterparty (usually an investment bank) to track the index. SGX had labelled synthetic ETFs with a “X@” symbol (e.g. Lyxor Asia US$, XT MSWorld US$, etc.) for ease of reference. Alternatively, you can visit the ETF provider page to read up the prospectuses for further information. There are also inverse ETFs, where if the indices go down, their prices go up, and vice versa. Inverse ETFs are used mainly for speculation and it is not meant for holding it long term. There is an inverse ETF on SGX called the XT S&P 500 – 1x US$ (see Figure 2), and can be found under Leveraged and Inverse Products (Specified Investments Products) in the SGX website. You may have noticed by now that there are listed ETFs with the same name but different currencies, like the CIMB APAC Div S$D and CIMB APAC Div US$. The S$D and US$, representing Singapore dollars (or SGD) and U.S. dollars respectively, are called trading currencies. Regardless of whether an ETF can be traded using SGD, USD, Euros or even Yen, all these are of no concern, for the most important part is not the trading currency, but the currency of the securities that make up the ETF. For example, if you have changed some SGD to buy a U.S. Dow Jones Index ETF in Sterling Pounds, the foreign exchange risk is between SGD and USD (which all constituents of the Dow Jones Index are based on), not the SGD – Sterling Pound and the Sterling Pound – USD pairs. ETFs are great investment vehicles to start off a passive index investment portfolio. In my next blogpost, I will highlight some of the considerations when embarking on one.